Here’s a short teaser of our live A/V performance system currently under development by us (Ethno Tekh). We’ll be releasing many more videos in the near future, including more performances with much high recording quality (apologies for this one), as well as interviews with both Brad and I outlining and discussing our project and approach. For the moment, please enjoy the very first video featuring our new system! I’ve recently teamed up with visual artist and programmer Brad Hammond (XY01) for our project Ethno Tekh. We’ve been slamming it hard and since we’ve teamed up in early August we’ve already had our first public interactive installation ‘public override Trichild()‘, which was a great success, as well as our first performance to an audience of over 3000 people at Microsoft’s TechEd 2012. We’re focusing on real-time, interactive and generative digital artworks; as well as larger-than-life and futuristic bass music A/V performances, all performed completely live using motion capture and audio-reactive visuals. 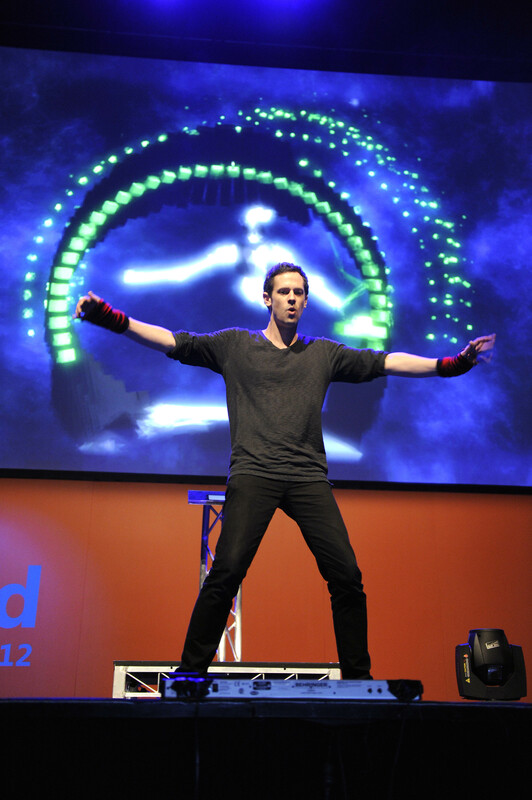 Video of the TechEd performance coming soon, but for now, there’s these couple of photo. But head to the Ethno Tekh Facebook page to keep updated on the project. We’ve got some interesting stuff coming up. Although I’ve spent literally the entire last 14 months of my life on making and performing motion capture music, with around live 30 performances I only just realised there’s very little footage online. 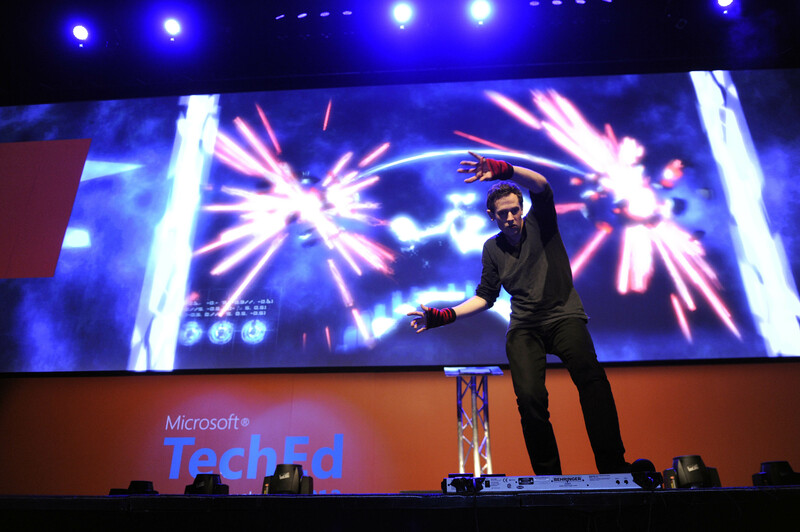 I’m currently in the process of updating my whole live performance system, so I most likely won’t be performing for at least a few weeks, so here’s an except of a performance I did earlier on in the year with my Kinect/foot pedal setup. I’ve been wanting to remix a YouTube video for ages, but it’s something I always put off. Not a video in particular, just any random video that inspires me. A bit of background on myself. Making my music (Synaecide) involves a lot of heavy editing to samples. There’s just something about zooming all the way into the arranger view of Cubase, cutting up, then manipulating little bits of audio into a track that gets me going. In high school I did a bit of video editing in media class, but since then I haven’t touched the visual side of things. Having said that, it’s an idea I’ve always been excited about. To get myself motivated, the idea was to pick a video and have a finished remix in 24 hours. The video I picked was Elders React to Dubstep (Skrillex). I ended up finishing it after about 10 hours of work. Here ’tis! I forgot to post this last month, but I was over in Seattle and forgot about it when I got home. A few weeks ago I was featured Australia-wide on printed newspapers and on their subsequent online services with both a written and video interview. You can check out the interview here.